Linked from an early age to the world of photography, is the author of several publications, including “Canada: nature in nature. A tour in the national parks of the Rocky Mountains,” “Digital Photography Practice. Initiation and Fundamentals”, Nàttùra, icelandic landscapes and Lightroom 5: Organization, management and development for photographers; and co-author of port of Valencia pictures “Portuarium. The autor has also co-authored several publications in nature, including in the “Guide to the Birds of Puerto de Valencia” in the “Guide to the underwater flora and fauna of the Port of Valencia” and “Guide of fishery resources of Fishermen’s Associations of Sagunto, Valencia and Gandia “. Contributor to various publications as” Walking through the Comunidad Valenciana 5. The Peñagolosa Mountains”, “Walking through the Comunidad Valenciana 6. El Alto Maestrazgo“, both by Esteban Cuellar. 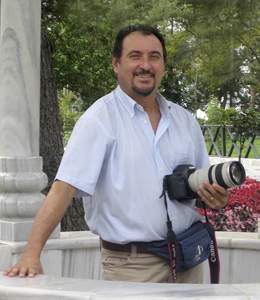 Some of his photographs have been published in newspapers and other publications. During his career as a photographer has won several awards and credits. He has participated in exhibitions-individual or collective- and he has taught courses and photography workshops. Passionate about nature photography, the transition from analogue to digital photography supposed a reencounter to him with the world of the image, which he have never forgotten. Deeply committed to the preservation of our environment, he try to collect with his camera different places, lights, undisturbed landscapes, natural values that are part of our heritage as humans and the conservation of which depends our survival on this unique blue planet on which we live.